Billing types for one-time services, annual services, or project work. Billing Types for ongoing services. Included Services (however this can also be used to describe one-time services). Both monthly and weekly recurring also have the option to collect catch up payments using pro-rata. Finally, at the bottom of the article you can see a video which shows how you can create a single proposal with a combination of billing types. When should I use this billing type? If Xero or QuickBooks Online is integrated, Practice Ignition will create an invoice as soon as the client accepts the proposal. Note: Even if the start date is in the future, an On Acceptance service within a proposal will create an invoice as soon as the proposal is accepted, regardless of the start date being in the future. If payments is enabled in your PI account, the once-off payment collection schedule will be applied (you can change your settings by clicking here). In the screenshot below, this account is set up to collect payments 3 days after the invoice is generated. If you haven't integrated your Practice Ignition account with an accounting package, you can still use PI to collect on-acceptance payments. For full details on using On Acceptance billing, click here. If you'd like to collect a fixed fee for a one-time service once the project is complete. If you are providing a one-time service or project where you'd like to collect a % of the payment upfront, and the remaining balance once the project is complete. For the remaining balance (or total balance if no deposit applied), you decide when the invoice is generated, which is done at the click of a button. 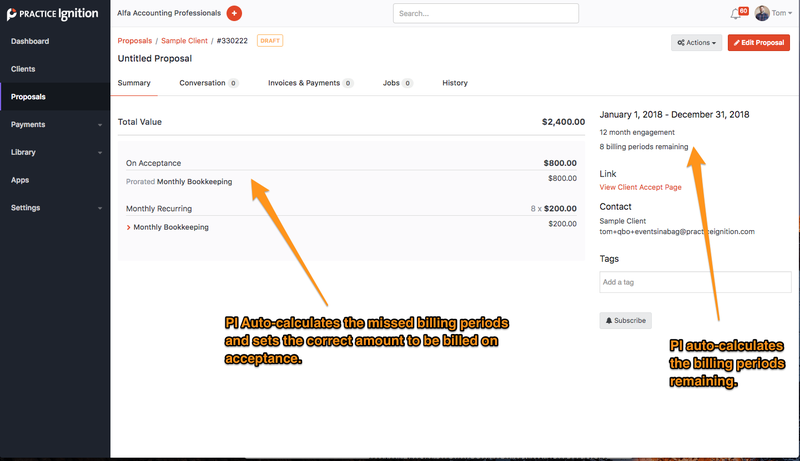 You can see the full instructions for invoicing on completion services here. As is the nature of project work, sometimes the scope of projects change, or you uncover additional information which does change the final price. The good news is you can edit the final price before generating the invoice. You can even add more details to the invoice if the price did change. Just like on-acceptance, If Payments is enabled in your PI account, the once-off payment collection schedule will be applied. In this case, the payment collection will begin immediately when you generate the invoice. If you haven't integrated your Practice Ignition account with an accounting package, you can still use PI to collect on-completion payments. Estimates work the same as the On Completion invoice (but they do not include a deposit option). The difference is the price is displayed as an hourly rate or a price range, and the price will not be included in the total value of the proposal. As such, you would use the Estimate billing type when the scope of the project cannot be clearly defined upfront. 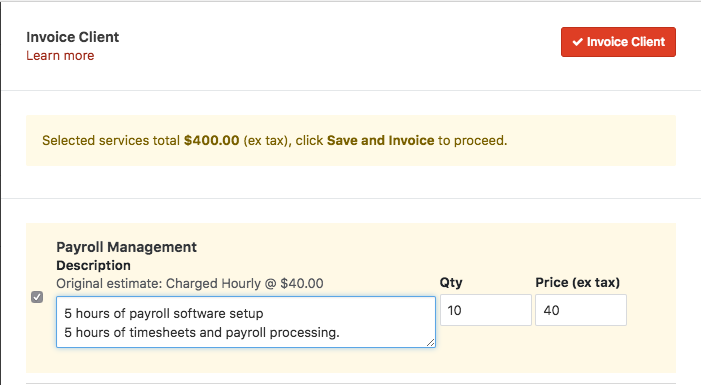 You decide when the invoice is generated, which is pushed to Xero or QBO at the click of a button (exactly the same way On-Completion is billed). For price ranges: Simply adjust the final price you'd like to bill in the price field. Just like on-acceptance and on-completion, If Payments is enabled in your PI account, the once-off payment collection schedule will be applied. In this case, the payment collection will begin immediately when you generate the invoice. For full details on using estimates, click here. If you provide services for your clients on an ongoing basis, you have a few options available to you to automatically generate invoices and collect payment. If you offer services on a repeatable basis, we recommend using monthly recurring, even if the repeated service is delivered on a different frequency. I.e. You deliver a service on a quarterly basis, monthly recurring provides a more consistent revenue stream for you, and simplifies cashflow for your client. If you offer one-time services but would like to split the fee collection across a number of months (i.e. provide your client with a payment plan). If you have debtors from previous projects/engagements you can use recurring services to build a payment plan so your client can pay their overdue debts in instalments. If you sell software subscriptions or other services that have fixed monthly costs. If you use Xero or QuickBooks Online, an invoice is generated automatically, once a month. When you create your proposal, you can choose the day of the month the invoice will be created. Each client can have a different monthly billing schedule. Monthly recurring payments pick up the Recurring Payment schedule. In this case, payment will begin collecting immediately after the invoice is generated, once a month. If you haven't integrated your Practice Ignition account with an accounting package, you can still use the Monthly Recurring Billing feature to collect monthly payment. When will invoicing and payment collection stop? 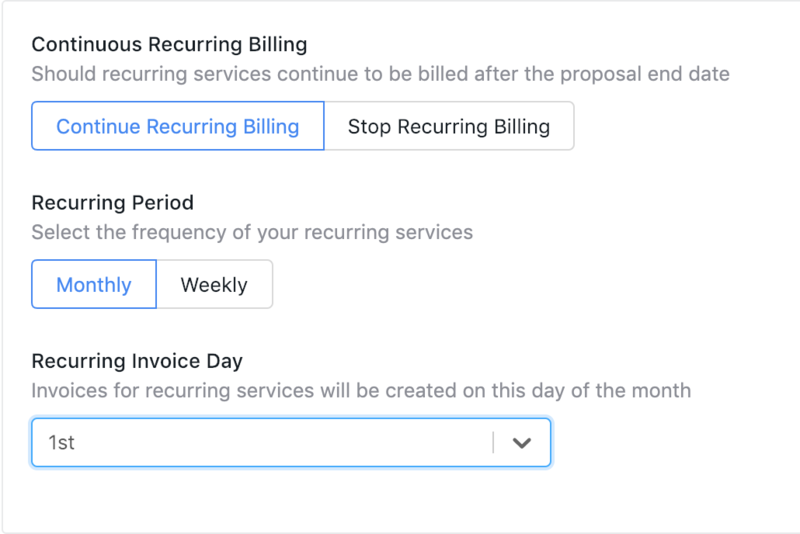 Choosing continue recurring billing means your recurring invoices and payments will continue to generate and collect indefinitely (and past the proposal end date). The recurring invoices and payment collection will stop if you adjust the proposal (and only once the adjusted proposal is accepted), or if you complete the active proposal. Choosing stop recurring billing means your recurring invoices and payments will only generate and collect on the recurring billing periods that fall between the start and end date. As soon as the end date passes, all recurring invoices and payments will stop generating and collecting. Weekly recurring payments pick up the Recurring Payment schedule. In this case, payment will begin collecting immediately after the invoice is generated, once a week on the global weekly recurring invoice day. If you haven't integrated your Practice Ignition account with an accounting package, you can still use the Weekly Billing feature to collect weekly payment. For full details on using weekly billing, click here. Both monthly and weekly recurring billing types give you the option to enable pro-rata. In Practice Ignition, pro-rata allows you to invoice and collect payments on missed billing periods in a proposal. Before we dive into pro-rata, it's important to understand the definition of a "billing period" in the context of Practice Ignition. Specifically related to recurring billing, a billing period refers to a single month (or week, if using weekly billing) in a proposal. Billing periods are defined by the recurring invoice day. To come up with a proposal total value, Practice Ignition counts the number of recurring invoice days that fall inside the contracted start and end date. Let's break down an example. I have started a new proposal where I've opted to have recurring invoices on the 1st of each month. 15 Dec - 31 Dec (note: even though this billing period is only two weeks, it still counts in the proposal, because the invoice day falls inside of the contracted start and end date). Now let's change the example slightly to a common mistake new PI users make. I've set the recurring invoice day to the 1st but I've changed the start date to the 15th. 15 Jan - 31 Jan - (note: This billing period does not get counted in this proposal because the recurring invoice day is the 1st. given that the proposal starts on the 15th, we can't count this as a billing period). 1 Feb - 28 Feb - This billing period now becomes the first recurring billing period of the proposal. or change the end date to the 14th of January, 2019. With these examples in mind, let's now explore how pro-rata works. When should I use Pro-rata? If you have catch up work and want to collect payment for that work upfront. To future-proof your proposals. If you are worried that your client will delay in signing the proposal until after the contracted start date, pro-rata will ensure you don't miss any billing periods. It's important to note, pro-rata does not calculate a daily rate, rather, it calculates the number of missed billing periods based on the start date of the proposal. 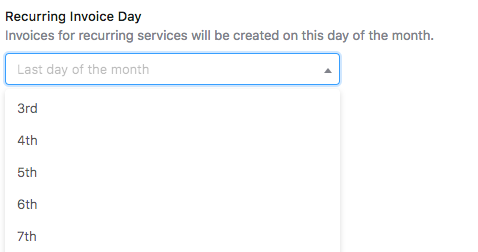 enable pro-rata on all recurring services. Most of my clients sign on time but one client misses the "deadline" and signs on the 5th of January. In this case, PI automatically identifies the 1st of January as a "missed billing period" and generates an invoice as soon as the client accepts. Better still, if the client hadn't signed until February, pro-rata will continue to re-calculate the number of missed billing periods and adjust the on-acceptance billing appropriately. For full details on using pro-rata and catchup payments, click here. If you provide value-added or complimentary services as part of your packages, use the Included Service billing type. Included services allow you to add additional services to your proposal that have no price. The included service billing type does not generate any invoices in Xero or QuickBooks online, but any included services in your proposal will be displayed on your invoices. The included service billing type does not generate any payments. 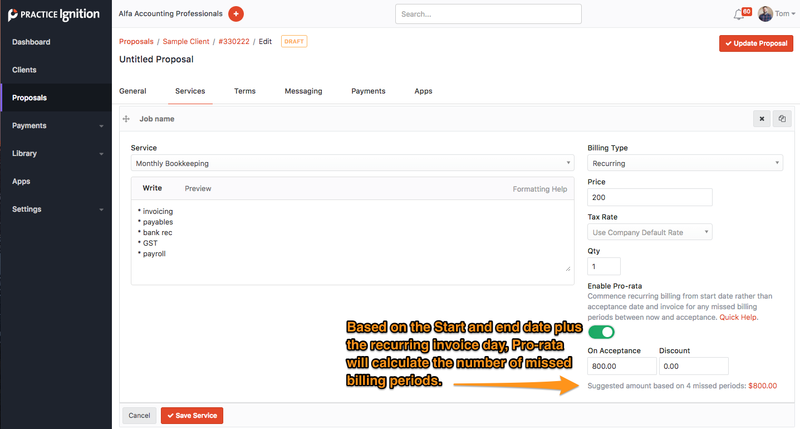 Create a single proposal with a combination of billing types.